UB Instant Layered Navigation now allows to sync product’s JSON data to AWS S3 to improve performance further. Adding advanced Shop By Brand functionality. Finally, here comes our brand new Magento 2 extension -- UB Instance Layered Navigation (beta). 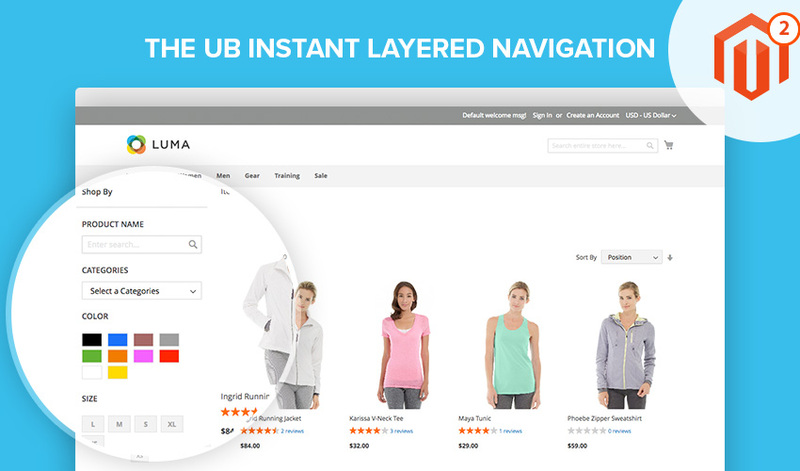 Introducing, the UB Instant Layered Navigation -- your one stop shop layered navigation for your Magento shop. 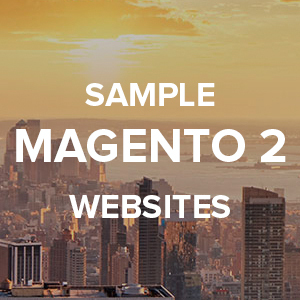 This extension is created from the ground up for Magento 2. After a careful polishing and added tweets, the UB Instant Layered Navigation offers a vast improvement over the default Magento layered navigation. 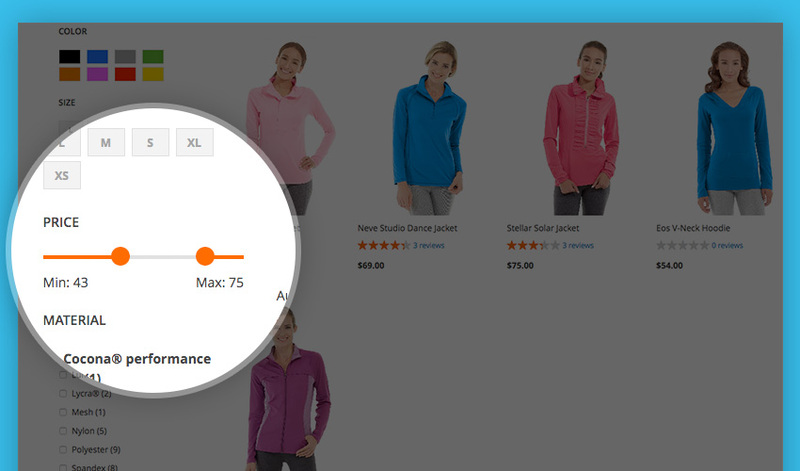 It provides a richer UX for your store with a number of interactive elements for faster and more dynamic product searching. Because who says multiple-categories filter, attribute filter, visual price slider, visual color switch and other filtering options need be a complicated? And since there is no limit to how quick instant can get, our layered navigation provides a smoother navigation of your Magento store. Now instant have never been this instant! 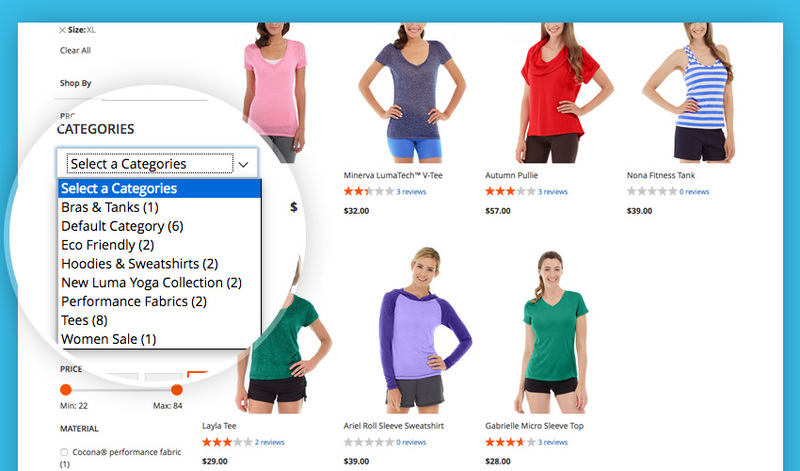 UB Instant Layered Navigation makes it easy to find and display products based on category and sub-categories. Whether your visitors are the type who load multiple categories products, would rather opt to display a list of products in a specific category, give them the luxury of optins by switching the configuration between Single, Dropdown, List or Multiple type in the Filter by Category setting. For a category to be used in layered navigation, set it to “anchor” and there you go! If your store only needs Filter by attribute, simply disable Filter by Category via admin. An exceptional feature of this extension is multiple filter attributes. It allows your page visitors to customize their own filter. They get to either choose among or combine a plethora of specific attributes such as style, climate, color, material, pattern, and price to name a few. A more extensive feature of filter by attributes is the additional layer of interaction with the customer. This sets it a notch higher over filter by category as it promotes flexibility. Once each attribute is selected, it automatically displays the number of matching record found. Tip: Default Magento has a total of 66 product attributes. To maximize the full use of your filterable attributes in UB Instant Layered Navigation, make sure you have Dropdown, Multiple Select or Price catalog input type. Visual scrollbar is ideal for any numeric filter like price, weight, width etc. UB Instant Layered Navigation allows to display price navigation as scrollable range slider, thus the customers can easily search the store catalog by price or other units of measure in the most efficient way. Once customers filter products by multiple attributes like color, size, brand etc., UB Instant Layered Navigation displays the number of matching records found instantly — without any page reloads. You know that excruciating feeling of having to wait for a page reload with every any single filter attribute update. Do not risk your conversion over this unnecessary hassle. When each filter option is checked and counted against every product in category, the pagination and results sorting will be updated instantly. This provides your customers a comfortably dynamic user experience. Even though UB Instant Layered Navigation overrides default Magento category page, all typical elements like Add to cart (In stock / Out of stock), Wishlist, Compare or Toolbar are in place. Among the major deciding factor for consumer purchase is the visual cue. Arranging color key option ready to sort and filter makes a good customer experience, not to mention leading you steps closer to successful conversions. With UB Instant Layered Navigation, color swatches can be defined as a component of the visual color attribute or text-based value. 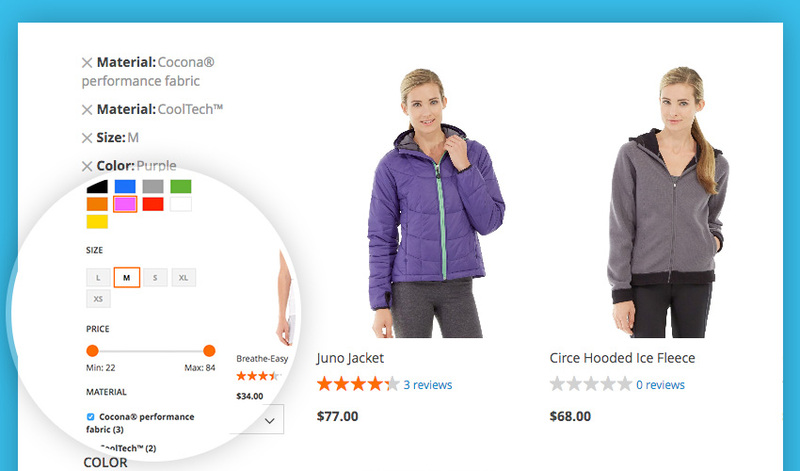 You can also depict the color, pattern, or texture by using uploaded product images. A downside of core Magento layered navigation is that it copes with the duplicate content issue that hurts your search engine optimization in the process. To overcome this drawback, UB Instant Layered Navigation uses a different approach. It renders the data and markup entirely on the client-side. Through this, despite not having to fetch the page over HTTP, the category page is still visible from Google and other search engines with an added benefit of faster page load and instant updates on pagination and results sorting. Meanwhile, UB Instant Layered Navigation preserves the attribute links which make it easy for the customers to move back and forth in web browser. It further preserves the core Magento category optimisation, which is a good news for your SEO optimization. Tip: Since search engine optimization relates further than your extensions and into the Magento platform itself, incorporating different strategies is vital as to climb up the SEO ladder. For further information, learn more about how to step your SEO game up. The concept of UB Instant Layered Navigation revolves around the core filter functionality. Hence, search options has been kept as is leaving opportunities for further improvement. 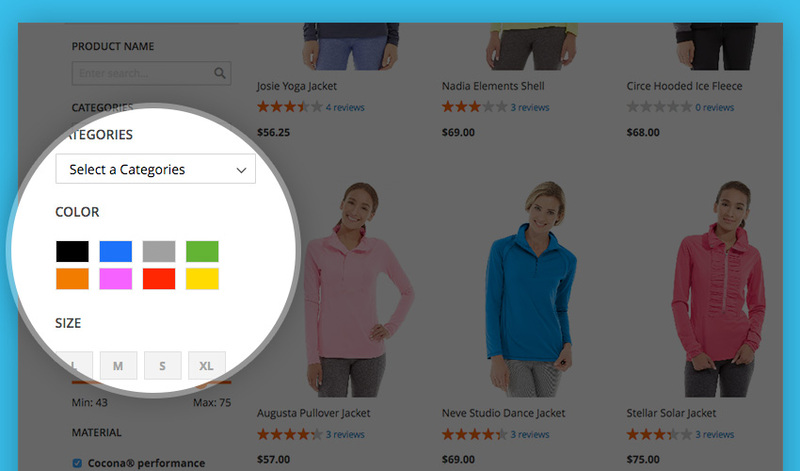 For specific product search, Filter by Product Title enables your visitors to go directly to specific items they have in mind. 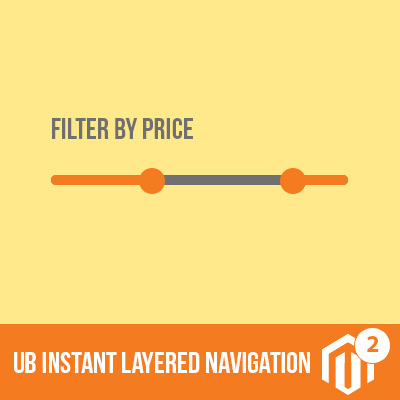 To avoid potential conflicts when integrating with any third party Magento 2 theme, UB Instant Layered Navigation automatically uses existing grid view of product list in your chosen theme. 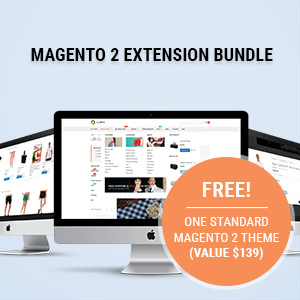 This extension integrates perfectly with any Magento theme of your choice. Dive into in your UB Instant Layered Navigation demo now! Ubertheme is dedicated to exploring the very possibility to improve your Magento store performance and we are confident that this new extension offers nothing but the best and easiest shopping experience to ensure your visitors will keep coming back. For further questions, clarifications and suggestions about our UB Instant Layered Navigation features, be free to express yourself in the comments below!